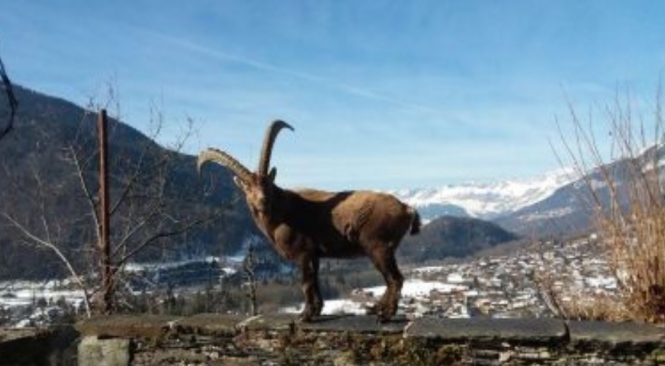 The animal has been staying in Danielle Belletti’s garden in the mountain village of Servoz, in the Chamonix valley, for three weeks, despite having easy access to the wild. He has the mountain breed’s imposing horns, and observers believe he is around 12 years old. Ms Belletti has nicknamed him “Gaston”, and said he usually spends the majority of his days wandering her garden, sniffing the lavender and nibbling the roses. She contacted Jacques Toni, a local wild animal expert and wolf catcher, when Gaston arrived - but he has not been able to explain the behaviour either. Mr Toni has admitted that he does not know why an ibex would take up residence in a local garden, and has been surprised by the apparent gentleness and domestication of the beast. Ms Belletti has taken photos of Gaston, but has not yet approached the animal up close for fear to her safety - although he has not been aggressive, and even shows affectionate signs of acknowledging her when she comes outside. Villagers remain welcoming but cautious. Ibex are also known as “steinbocks” in English, and “bouquetins” in French. Although often referred to as a “deer”, they are actually more closely related to wild goat, and do not eat meat. They tend to live in mountainous regions, and usually prefer higher altitudes near the mountain “snow line”. In Europe, they can be found across the European Alps, including in France, Italy, Germany, Switzerland, Austria, Bulgaria, and Slovenia.